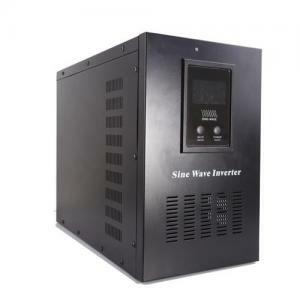 UPS 5000VA-3500W pure sine wave inverter_Solar&Wind Product_Product_Get high quality goods directly from the original factories! 1, Auto Voltage Regulation(AVR): When the utility input voltage is unstable, this unit allows precise and stable output voltage to be achieved. For example, in China, the utility voltage can drop to 190V at peak demand, this unit produces an output voltage of 220 V± 3% V, 50 Hz± 0.5, which can help to protect electrical equipment. 2, DC/AC Conversion Function: Battery Power: When the electrical power fails suddenly in the home, office, supermarket, industrial districts, it can be an environment-friendly engine; In some outdoor areas without electricity, it can be used as Mobile Power and provide AC power for household appliances. 3, Intelligent Charging Function: . When batteries run out of power, inverter can be connected to the utility and automatically charge the battery. When connected with utility and battery, it can become a UPS system, which can charge batteries automatically when output utility is connected, The charging process can be divided into three sections. Section I: With largest constant current charging, this can improve the backup power. Section II: Constant voltage charging to charge batteries gradually, then there is enough time for batteries to absorb energy. Therefore, battery electrodes are protected and battery overcharge can be avoided. Section III: When inverter senses that batteries are fully charged, it will turn into float voltage to maintain full power state of batteries for a long time. 4. UPS Function: When batteries connected with utility, inverter will form output UPS function. Step 1: When utility is available, it will output directly after stabilizing voltage and charge batteries stimultaneously. Step 2: When utility cuts off, the system will invert DC from battery to AC to ensure uninterrupted power supply. Step 3: When utility comes back, the system will turn into utility power supply automatically and charge batteries simultaneously. effiecny is 95%, i will send you a mail for shipping cost to Italy. very satisfiy about you service.